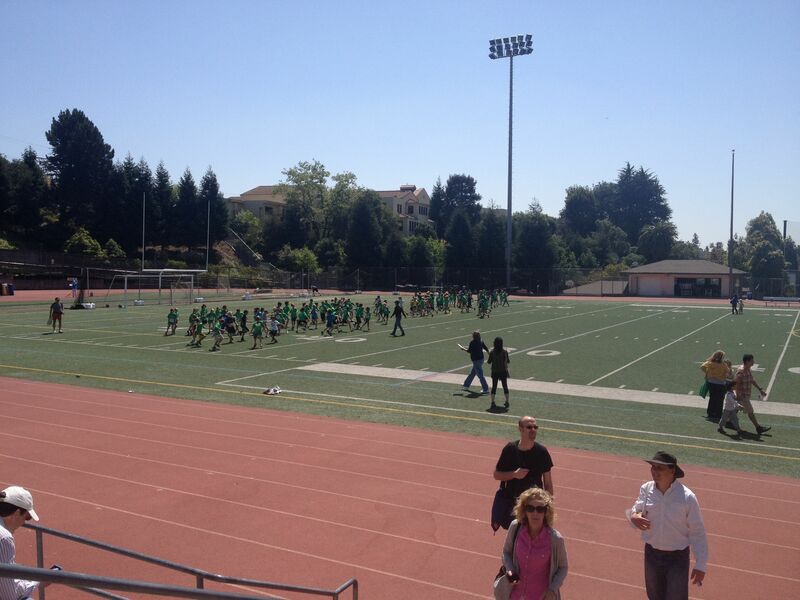 The 2013 Piedmont Relays was a wonderful afternoon of running, throwing and jumping with ideal weather conditions. Over 300 kids took part, and once again we set an attendance record. It was quite a sight to see so many kids on the field and track at Witter, plus the spectators in the bleachers. We really appreciate the community getting behind this event and supporting it. The Relays were planned and organized by the by the Piedmont Recreation Department in partnership with the Beach, Havens and Wildwood Dad’s Clubs. Proceeds from this year’s meet will benefit these organizations and a donation will also be made to help support “Running for a Better Oakland “(RBO), a non-profit organization that encourages kindergarten through 12th grade Oakland students to develop healthy lifestyles through running. In addition, the plan is to make a donation to the victims of the Boston Marathon bombing. A special thank you to all the volunteers who assisted with the meet and especially to Piedmont teachers Raul Jorcino, Laura Richey, Heidi Sawicki, Sandy Martin and Kelly Ellis for their help in putting on the meet. Finally, thanks again to our sponsors for their support; Transports Running Store, Highland Partners, Ace Hardware, McCutcheon Construction, and Lake Merritt Joggers & Striders. Finally, when the new school year starts in August, the Rec Dept. will be offering a new after-school running program for 4th & 5th graders, “Junior Cross Country.” It will be a pilot program, based at each school and enrollment will be limited. Below are some of the key points regarding the program, we hope your child will want to participate. The registration form will be available in August.